For months, I’ve been talking with my friend Canard about a project of interacting with a computer without touching it. We are convinced that it can be done with a simple webcam and that the “depth” information is not needed for simple interactions. (So no need to buy a kinect or two webcams). Yesterday we started hacking on this. 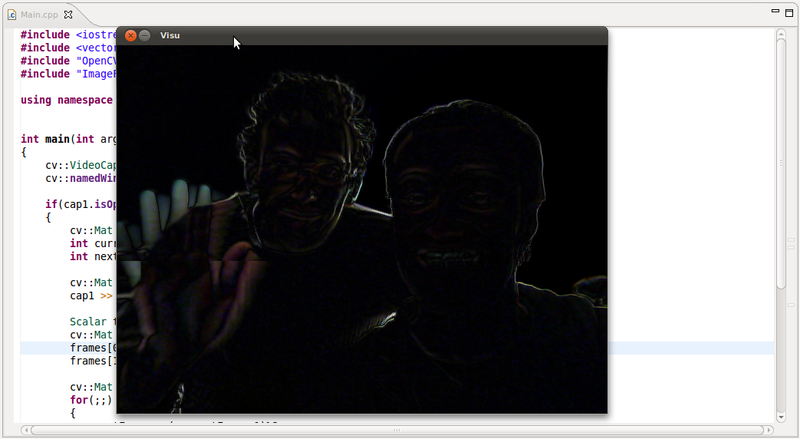 We are using OpenCV. We first discussed about the different steps of doing it. But as we explored OpenCV, we changed some of these previous decisions because we found some built-in functions. You can check out the code (and fork us) on our github repository. Stay tunned to follow our progress. vous êtes beau sur la photo ! EXcellente idée, Quelques recherches sur le langage des signes pourraient vous servir.